Each of my boys will be getting a Growums pack in their Easter basket this year. I think this may be my favorite item in the basket. My boys love to work with Daddy on the annual vegetable garden we have on the side of our house. Each year we have a variety of veggies and the boys love helping to cultivate and grow our food. This year, my kids will each get a Growums Gardening Kit. These kits for kids include several different kinds of seeds in each kit. They come in themes – so for example, the Pizza Garden has seeds for Roma Tomatoes, Basil, Oregano and Bell Pepper. You can follow along with the progress of your seets on the Growums.com site too. The kids can login and watch videos and read information about their plants at various stages. 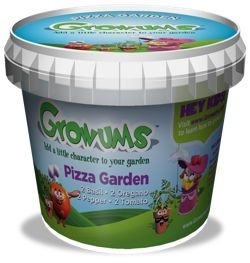 Growums cost $9.99 per kit. Disclosure: I received samples of Growums to facilitate this review. All thoughts and opinions are my own.